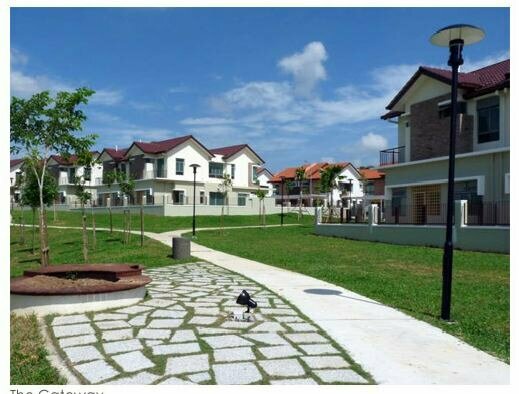 Horizon Hills is one of several new gated and guarded housing communities that are part of Malaysia’s Iskandar initiative. These new housing estates are clustered near the 2nd link to the west of Johor Bahru cityin the are alled Nusajaya, which encompasses Bukit Indah, Horizon Hills, East Ledang and Ledang Heights. Horizon Hills is still being developed. Several precincts are completed and occupied (there are a total of 13 residential precincts planned). These are made up of bungalows and semi-detached units. High-rise units are under construction now. Horizon Hills township include 1,200 acres of land inn the center of Nusajaya. Like many of the housing estates Horizon Hills incluses a golf course (which many of the housing units look onto). Security is a key selling point of the housing estates and they have multi-layer security in place. Another big selling point is the opportunity to have a plot of land (and maybe a garden, if one choses). Another big reason expats chose Horizon Hills is the proximity to the 2nd link (which has less issues with jams than the causeway link has). The Nusajaya region is still early in the development plan and so one of the drawbacks is that some of the planned resources (Lego Land, shopping, restaurants, public transportation…) are not in place yet, or are sparse. But things are moving quickly, great progress has been made in the last few years and by the end of 2012 a even more will be completed. The new coastal highway (to CBD and the causeway) and Newcastle University are high profile completions in 2011. Prices of homes range from about RM 500,000 to over RM 1,500,000. Rent from RM 2,500/m to over RM 10,000/mo. There are plenty of choices from RM 2,500 – RM 4,500/month (over 2,500 square feet, cluster homes and semi-detached). The house design is not as beautiful as those semi-detached and bungalows at Sutera Utama. The design is too plain.